A 2,479-seat, multipurpose concert facility, Robert S. Whitney Hall, part of the Kentucky Center for the Arts, can accommodate everything from the most elaborate touring Broadway extravaganzas to the more modest requirements of a chamber music ensemble. Named for the eminent former conductor of the Louisville Orchestra, this theater has exemplary acoustics, comfortable seats and generally uninterrupted sight lines to ensure that every patron enjoys their theatrical experience to the fullest. 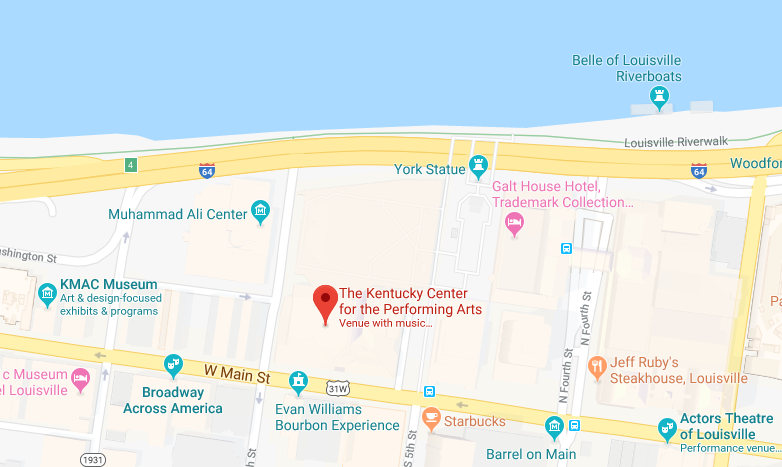 Local arts organizations currently utilizing Whitney Hall include the PNC Broadway in Louisville and the Louisville Ballet as well as The Kentucky Center Presents. All persons and bags are subject to search. Sharp objects weapons and illegal contraband are not permitted into the venue. For your own safety, and that of all of our patrons, guests may be required to undergo electronic security screening at the entrances to the Theatre. The items listed below, and any additional items that Theatre management determines could potentially distract from the audience’s safety and enjoyment, are prohibited items which will not be allowed inside the venue. The Theatre reserves the right to eject or bar entry to patrons who have such prohibited items in their possession. No refunds will be given. For your convenience, please make other arrangements for these items before arriving. The Kentucky Center does not provide lockers and will not check or hold any personal belongings. *Exceptions will be made for those with disabilities, medical requirements and/or special needs. Guests with specific/special dietary needs due to disabilities, medical conditions or special needs should contact by email prior to attending the event to arrange for reasonable accommodations. (from Elizabethtown): Take I-65 North to Muhammad Ali Blvd. Go to Fifth Street and turn right (this is the only way to turn). Follow Fifth to Main and turn left. The Kentucky Center is located between Fifth and Sixth streets on Main Street.